A solar eclipse as seen from Mars | Watts Up With That? PASADENA, Calif. – Images taken with a telephoto-lens camera on NASA’s Mars rover Curiosity catch the larger of Mars’ two moons, Phobos, passing directly in front of the sun — the sharpest images of a solar eclipse ever taken at Mars. Phobos does not fully cover the sun, as seen from the surface of Mars, so the solar eclipse is what’s called a ring, or annular, type. A set of three frames from Curiosity’s Mast Camera (Mastcam), taken three seconds apart as Phobos eclipsed the sun, is at http://www.jpl.nasa.gov/spaceimages/details.php?id=PIA17356 . The images are the first full-resolution frames downlinked to Earth from an Aug. 17, 2013, series. The series may later provide a movie of the eclipse. Curiosity paused during its drive that day to record the sky-watching images. Observations of the Martian moons, Phobos and Deimos, by Curiosity and by the older, still-active Mars rover Opportunity are helping researchers get more precise knowledge of the moons’ orbits. During the Aug. 17 observation, the position of Phobos crossing the sun was a mile or two (two or three kilometers) closer to the center of the sun’s position than researchers anticipated. NASA’s Jet Propulsion Laboratory, a division of the California Institute of Technology, manages the Mars Science Laboratory Project for NASA’s Science Mission Directorate, Washington. JPL designed and built the project’s Curiosity rover. More information about Curiosity is online at http://www.jpl.nasa.gov/msl , http://www.nasa.gov/msl and http://mars.jpl.nasa.gov/msl/ . You can follow the mission on Facebook at http://www.facebook.com/marscuriosity and on Twitter at http://www.twitter.com/marscuriosity . During the Aug. 17 observation, the position of Phobos crossing the sun was a mile or two (two or three kilometers) closer to the center of the sun’s position than researchers anticipated. If planetary geometry isn’t as settled a science as they thought, what chance does climatology have? Now tell us what it really is. Interesting. Phobos is only about 20 miles wide at its biggest as opposed to 2000 for our Moon, so the whole concept is far different for Mars than Earth. And whoever knew to calculate the upcoming eclipse/transit really knew their stuff; the eclipse track on the surface of Mars must have been about the same as a two-lane road. I take it that Phobos in its orbit was a mile or two north or south of the position that had been calculated for it. If Phobos is about 20 miles wide at its biggest, then the diameter of an object that would have exactly covered the view of the sun would have been about 30 miles. Hence from a location where the top edge of Phobos just touched the sun’s top edge to where the bottom edges coincided would have been about 15 miles. So the track of the ‘annular’ eclipse would also have been about 15 miles wide. Slightly off this topic, there can be not only an annular eclipse of the sun by the moon as seen on earth, there can also be an annular eclipse of the sun by the earth as seen on the moon. I leave that to contributors to try to figure that out. Deimos is smaller and farther away, but ultimately more fun, see my old The Great Escape of The Martian Festival summary of events held there. That’s about three parts in 2 x 10^8? Trick question, I’m sure, but I assume the answer involves seeing the very distant sunrise and sunset while the Sun is below the horizon…. I especially love working with kids who are also on the Autism Spectrum Disorder scale. I have very fond memories of two boys, both on the high intelligence part of the multilayer spectrum but who had lots of difficulties with social and sensory issues. But, put them in front of a science task and they sang like nightingales. One of their favorite research and writing topics was to choose a moon in our solar system to study. One boy chose Phobos, and the other chose Saturn’s very interesting moon Enceladus (among a plethora of interesting moons). I have discovered something very important about the excitement of new learning in these children. They don’t have preconceived or “pet theories”. All things are studied with equal open eyes, logic is used as the key to separate myth from fact from opinion and everything is given equal intelligent treatment. I remember the unemotional response to learning about the early history of belief of human-like development on Phobos. These boys see regular and irregular shapes in everyday life ALL THE TIME and do not ascribe human origins to them as their first thought. So learning about the “object” on Phobos and the initial media response to it was readily dealt with in Autism style. Without nasty ridicule, or derision, it was discussed and dealt with using that wonderfully dry intelligent conversation that often describes kids on the spectrum. It comes off rudely if you are not on the spectrum because myth and opinion are swiftly and logically dealt with so well that people often have difficulty responding to it, but to me the pure logic of their reasoning is ear candy. So if you have a pet theory not well founded in observation and fact, and happen to come upon a grown up version of these two boys, be prepared to have your pet theory dryly, quickly, and completely cut to shreds. Maybe Anthony enrolled his daughter to document this one too? I’d put “eclipse” in quotations. I understand that Anthony is alluding to a moon moving in front of the sun and for the sake of the HEADLINE liberties can be taken. Transit is the appropriate term of art I believe. Pamela – what a wonderful description of the thinking power of these marvellous kids! Tell them that out there, there is one albeit ageing professor who is full of admiration for what they do. Pamela Gray: IOW, the Sheldon Cooper treatment. The angular diameter of the sun as seen from the moon is 31.6′ – 32.7′. The angular diameter of the earth as seen from the moon is 54.0′-72.2′. No annular eclipse of the sun by earth as seen from the moon. It’s actually close-up pictures of the eyes of the Tumblr “FUUUUUUUUUUU” guy. @Pamela Gray: You have just described in essence almost every discussion I (a chemist) have with my brother Jim (the mathematician) and/or my brother Bill (the physicist). Almost missed a photo of the 1994 annular solar eclipse while the elementary school kids watched it through my telescope. Happened to be in a location where I was about 30 miles north of dead center so took the rig to the local Catholic school. Many of the kids loved it. No longer live in that area and often wonder how many of those now grown up kids might now be into astronomy. Interesting that some were wowed by it with tons of questions and others had very little to no interest. I especially love working with kids who are also on the Autism Spectrum Disorder scale. NASA. One side dazzling us with stuff like this, the other making a mockery of our intelligence. Ahh, the annular, diamond ring. On Earth it represents the Sun-god (Ra, Helios, Sol) caught in flagrante delicto with the Moon-goddess (Isis, Selene, Lunar). And their love was sealed with a diamond ring. The old cosmic religions were much more interesting. Who needed a soap opera? As a scientist myself, I can appreciate this clear view of the world. I am glad to hear that you appreciate this perspective, too. Amazing photograph, very impressed that this could have been predicted as it looks like Phobos crosses the suns disc in under ten seconds! I hope to one day live to see man set foot on the planet, but these photographs are awesome in themselves! as in the Roche limit or Chandrasekhar’s limit? would rise in the Martian equivalent of the west. a. the passage of a heavenly body across the meridian of a given location or through the field of a telescope. b. the passage of Mercury or Venus across the disk of the sun, or of a satellite or its shadow across the face of its primary. A doesn’t apply, C is uninformative, B is Earth-centric, but can be stretched, but on its face, Luna, Deimos, and Phobos can’t transit, clearly bogus. A transit is the astronomical event that occurs when one celestial body appears to move across the face of another celestial body, hiding a small part of it, as seen by an observer at some particular vantage point. If the first celestial body hides a major part, or all of, the second celestial body, then it is an occultation rather than a transit. A transit occurs when a celestial body crosses the meridian due to the Earth’s rotation, about halfway between rising and setting. For instance, the Sun transits the meridian at solar noon. Observation of meridian transits was once very important for timekeeping purposes (see transit instrument). The term star transit is used for the passage of a star through the eyepiece of a telescope. Precise observations of elevation or time are carried out to determine star positions or the local vertical (geographic latitude/longitude). An eclipse is an astronomical event that occurs when an astronomical object is temporarily obscured, either by passing into the shadow of another body or by having another body pass between it and the viewer. An eclipse is a type of syzygy. The term eclipse is most often used to describe either a solar eclipse, when the Moon’s shadow crosses the Earth’s surface, or a lunar eclipse, when the Moon moves into the Earth’s shadow. However, it can also refer to such events beyond the Earth-Moon system: for example, a planet moving into the shadow cast by one of its moons, a moon passing into the shadow cast by its host planet, or a moon passing into the shadow of another moon. A binary star system can also produce eclipses if the plane of the orbit of its constituent stars intersects the observer’s position. This is also vague. Clearly “obscured” does no mean “covered” as that would rule out partial and annular eclipses. However, we admit to a “partial solar eclipse” if any part of the Sun is obscured by Luna, and Phobos did obscure part of the Sun. Also, the penumbral shadow cast by Phobos tracked across part of Mars. Therefore “a planet moving into the shadow cast by one of its moons” applies. @Pamela, your name may be ‘gray’, but that vignette was anything but. Thank you for a lovely start to my weekend. Looks like a transit of Phobos to me. Well they all are “roughly” spherical. Or the polar equation:- a = const. Nor ANY other equation either. ALL of mathematics is pure fiction. Hey! Phobos really IS shaped like a potato! I, too, would go happily with the atmospheric solution to Dudley’s puzzle, but also throw in the possibility of the corona being included as part of the Sun (which, of course, it is). I imagine the red refracted light surrounding the Earth with the solar corona behind to be quite a sight. Speaking of sights – when I observed the transit of Venus back in 2004, just as the planet appeared to touch the Sun its atmosphere lit up as an entire ring with refracted sunlight. Made the hairs stand up on the back of my neck in a very unscientific manner. If Venus had Earth’s atmosphere, what would conditions there be like? Diemos occulted by Phobos in a 55sec time lapse taken by Curiosity on 1 August 2013. The 55sec transit was compressed to 15sec. I wonder why they bothered ? Venus has no significant magnetic field, so in very short order all the water vapour would be removed by the solar wind (hydrogen and oxygen split, hydrogen whisked away). In longer order, because Venus has no plate tectonics, it is thought the planet might “boil over” every so often (geologically speaking) where the entire surface becomes molten. This would release vast amounts of CO2 into the atmosphere. So, Venus being Venus, the answer to your question might be – eventually – like Venus. A more complicated scenario might be to consider what conditions would be like if the Earth replaced Venus in its orbit. Hmmm, superheated, expanded greenhouse atmosphere of water vapour leading to eventual hydrogen loss (despite magnetic field)? With water removed, plate tectonics stop and planet boils over releasing vast amounts of CO2? So, eventually, like Venus? Interestingly, on Venus today, at the level in the atmosphere where the pressure is the same as on Earth, the temperature is only about 10C higher. This despite the planet being much closer to the Sun and the atmosphere being almost entirely CO2 (plus being above deep levels at very high temps). With an oxygen mask and some serious Sun-block, you could probably walk around (on a floating platform) in shirt-sleeves. Here’s a pic up close of Phobos, anyone know what caused those grooves? Because by throwing out nearly 3 out of every 4 frames, they greatly reduced the work when they photoshopped out the support cables, duh. Forget the corona. You would not see it due to the bright red glare of the refracted sunlight in the Earth’s atmosphere, which has to look like a perfect very bright ring (assuming the Sun centered behind the Earth). I’m not convinced, Carsten. I’ve seen a lot of lunar eclipses over the years, and in some the moon gets very dark indeed (with our night sky suitable for some deep sky observing). In those circumstances I don’t think the red ring would be especially bright. Will look into it some more when I get back home from work. 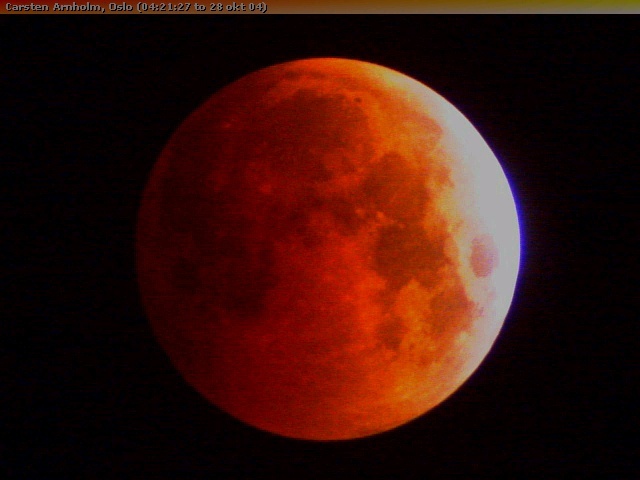 There are images of solar eclipses from near the Moon. The best is a movie made by Japanese satellite kaguya, of Earthrise during a partial eclipse http://space.jaxa.jp/movie/20090218_kaguya_movie01_j.html . It was slow to load, but played fine. It is color, but overexposed so you can’t see the sunrise/sunset colors. http://science1.nasa.gov/science-news/science-at-nasa/2009/25feb_kaguyaeclipse/ has links to that and also the first photo, from Surveyor 3, and a link to a photo from Apollo 12’s return trip. PJF, atmospheric scientists look forward to lunar eclipses as a means to gauge how much dust is in the atmosphere. The darkest eclipses are a while after large volcanic eruptions. From the photos I just posted, I was reminded that the bright ring is very narrow – just the height of the dirty part of the atmosphere. There’s not much illumination there and lunar soil is dark to begin with (but at least the full moon increased albedo effect is in full play). You said it Mike Bromley. The “Right Stuff” NASA doesn’t work with “If…but…maybe” logic. When you send a manned mission into space there’s no room for error bands. If you’re not right on the button then people die. Compare that with the “Wrong Stuff” NASA. When we get to terraforming Mars, one of the first things will have to be lowering of Phobos’ orbit so it can do proper solar eclipses. No, no – we need to move Phobos out and use it as the anchor for a space elevator. Read Kim Stanley Robinson’s Red Mars. Or is it in Green Mars?